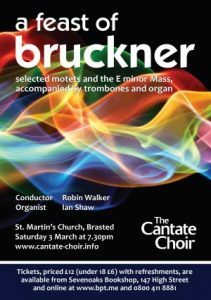 We performed the E minor Mass and a selection of sacred motets, accompanied by organ and trombones at St. Martin’s Brasted on Sunday 22 April. It was a lovely sunny evening, quite a contrast from the original planned date of the concert which was postponed from March due to the snow. Through their gorgeous harmonic language and polyphonic layering, their roving melodic lines and unexpected dissonances, these pieces represent compelling examples of Bruckner’s intense sound world. It was a stirring and rewarding evening. Please note that the poster below has the old date on it. Born in Cremona, Monteverdi was a composer and court musician particularly known for books of madrigals and operas. 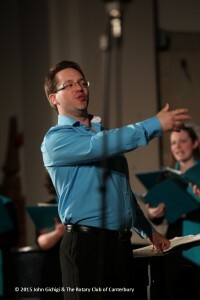 His work transitions from Renaissance polyphony to Baroque melody including pioneering techniques such as bass continuo. The Vesperis in Festis Beata Mariae Vergine, more casually known as the Vespers of 1610, was his first sacred work in nearly 30 years reflecting a blend of both styles. In scale it represents one of the most ambitious works of religious music written before Bach. 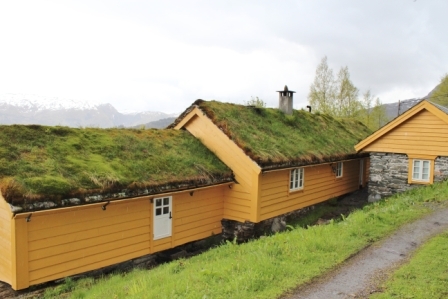 It is a large, complex and ground-breaking piece noted for its brilliance and power. 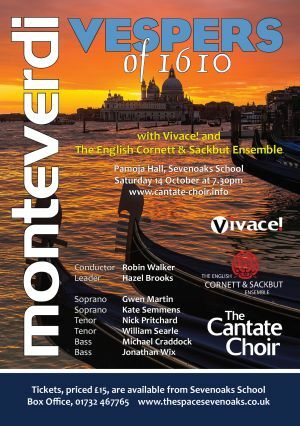 Special guest soloists will perform with The Cantate Choir and we will be joined by Vivace and The English Cornett & Sackbut Ensemble for what promises to be a wonderful evening. With William Searle (tenor) and Ian Shaw (organ). 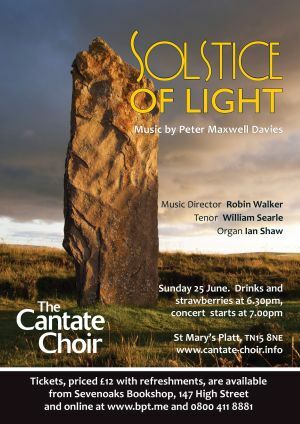 The centrepiece of our summer concert was the Solstice of Light, Peter Maxwell Davies’ Cantata for tenor, choir and organ. Its fourteen movements form a poetic history of Orkney with beautiful melodic moments and some wonderful harmony. This highly evocative piece was performed as the long light of June lasted into the evening making it a very special occasion. We also be presented a wonderful setting of Shakespeare’s song from Cymbeline, Fear No More, by Jonas Magnussen, being performed for the first time in the UK, as well as two pieces by New Zealand composer Paul Newton-Jackson. 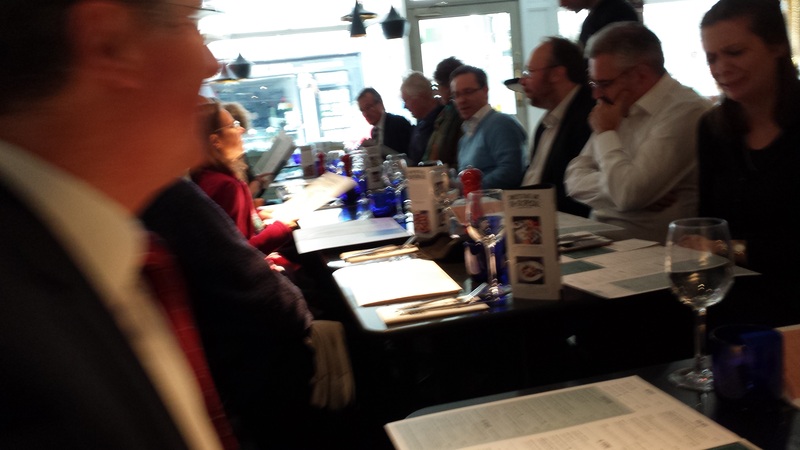 We were joined by special guests, tenor William Searle and organist Ian Shaw. William performed a beautiful selection of English solo songs as well as the tenor role in Solstice of Light. Ian played an organ solo during the first part of the concert as well as performing the fantastic, virtuoso solo sections in Solstice of Light. Strawberries and drinks were at 6.30pm in the Churchyard and the concert followed at 7.00pm. Saturday March 4th 2017 – St. Martin’s Church, Brasted. The choir performed a capella music full of melody and luscious harmony by Mendelssohn, Elgar, Vaughan Williams and Britten, while our special guest soloist Philippa Mo played a range of pieces for the violin. 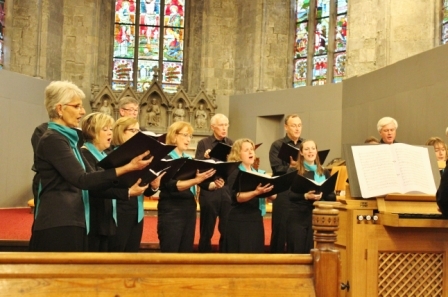 Two of Mendelssohn’s motets for eight-part choir opened the concert. Philippa then played two pieces for violin by German Romantic composer Rheinberger; she was accompanied on the organ by Robin Walker. 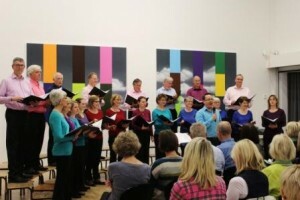 Britten’s Five Flower Songs followed, fascinating settings of works by poets such as Herrick and Clare. Philippa then performed a new work by Frederick Frahm Grendel’s Soliloquy. Closing the first half was Sir Edward Elgar’s famous Nimrod, arranged for choir and set to the text Lux Aeterna. The second half was a feast of Vaughan Williams, opening with The Lark Ascending. The choir then performed the composer’s Mass in G minor for double choir and soloists, a truly great work of the English 20th century choral tradition. 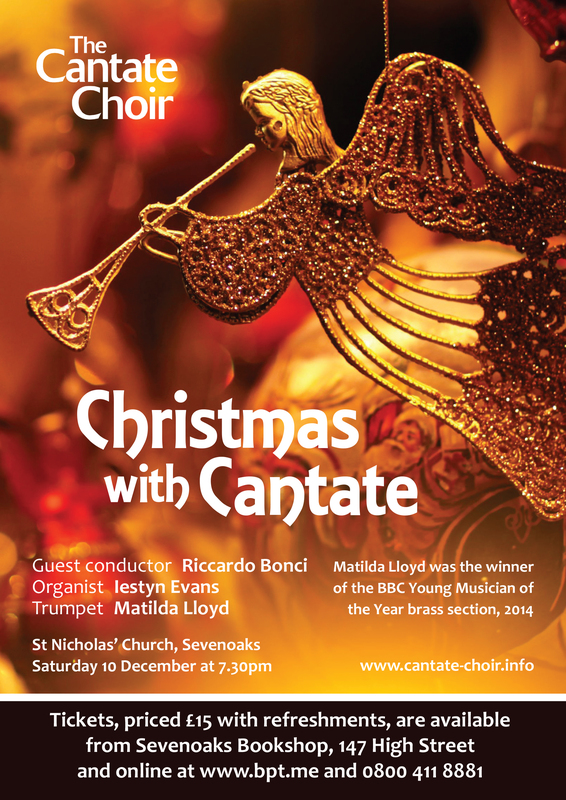 The Cantate Choir performed a sparking celebration of Christmas in December at St. Nicholas Church, Sevenoaks. We were very fortunate to be joined by Matilda Lloyd, the wonderfully talented trumpeter who won the brass section of the BBC Young Musician of the Year 2014, and whose solo pieces by Bach and Damase were very much enjoyed by the audience. 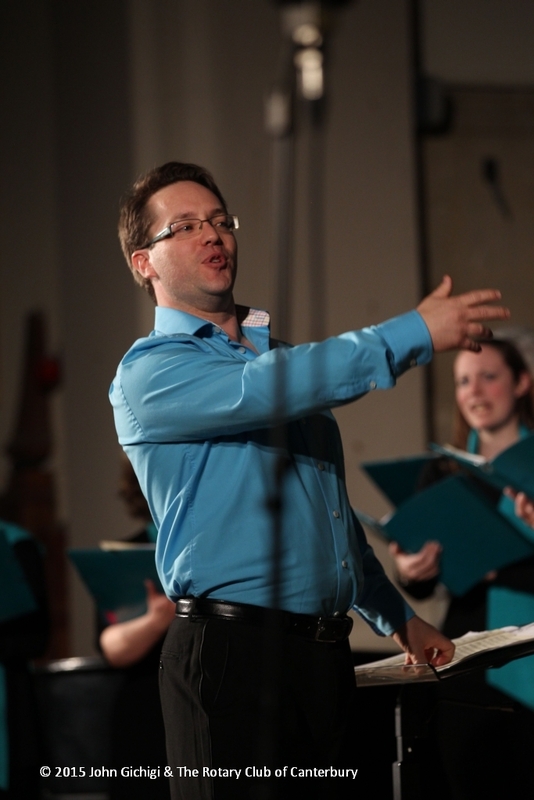 The choir, under guest conductor Riccardo Bonci, performed a variety of Christmas carols, including some new ones to us – by Maxwell Davies, Wishart, Matthias and Howells. Of course there were plenty of audience carols too and Matilda joined in playing from the gallery and Iestyn Evans joined us on the organ. The evening included rousing renditions of popluar favourites The Twelve Days of Christmas and Jingle Bells, with We Wish You a Merry Christmas as a spirited encore. With guest conductor Riccardo Bonci and organist Iestyn Evans. Our Christmas programme will feature carols, old and new. From Wassail song to Wishart, with Bach, Vaughan Williams and Rutter, and, of course, we hope you will join with us to sing our favourite carols together! This year we are delighted to be performing with our very special guest soloist – Matilda Lloyd on trumpet. Matilda won the brass section of the BBC Musician of the year in 2014 and made her Proms solo debut this year with the BBC Philharmonic; she has also played with the Academy of St. Martin in the Fields for the Classic FM Live concert at the Royal Albert Hall and she has appeared on In Tune on Radio 3. She works with a variety of orchestras and she currently reads music at Trinity College, Cambridge and studies the trumpet with Mark David, Head of Brass at the Royal Academy of Music, London. She will be joining us to perform many well-known carols and she will be playing solo pieces including Bach’s Concerto in D Major after Vivaldi. For a glorious, sparkling start to the Christmas season do come and join us! Tickets are £15 including refreshment and are available at Sevenoaks Bookshop or online and by phone from Brown Paper Tickets on www.bpt.me and 0800 411 8881. They will also available from members of the choir. 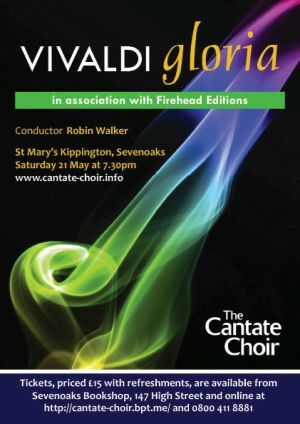 The Cantate Choir were delighted to have been invited to take part in a special multi-choir concert at the Rye Festival in September. Three choirs came together to collaborate on an evening concert in St. Mary’s Rye. 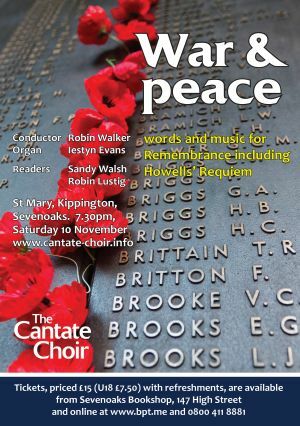 Each choir presented a short programme and we were very pleased to perform again some music from our summer concert – a piece by Frederick Frahm, Who is Wise Among You and the piece Huw Morgan dedicated to Robin Walker and Cantate Choir: Ave Regina Caelorum. We then joined with the other choirs to form one very large chamber choir. Together we performed multi-part music, working up from Lotti’s beautiful 8-part Crucifixus to the breath-taking 16-part Crucifixus by Caldara and climaxing with Tallis’ 40-part masterpiece Spem in Alium. 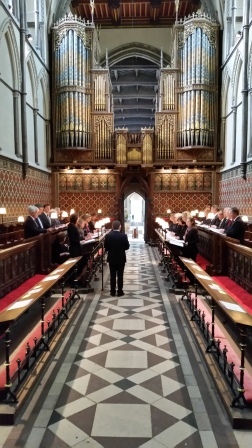 We are thrilled to have been asked to take part alongside The Straight 8 and Tongswood Chamber Choir and the full choir was conducted by the internationally acclaimed Peter Phillips, founder of the Tallis Scholars. 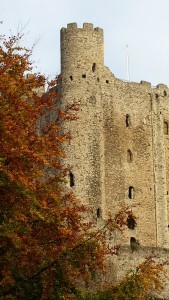 The organisers in Rye treated us exceptionally well and we had a lovely day. It was a beautiful Autumnal weather and you can see members of the choir enjoying a few moments of rest over the view of Romney Marsh. 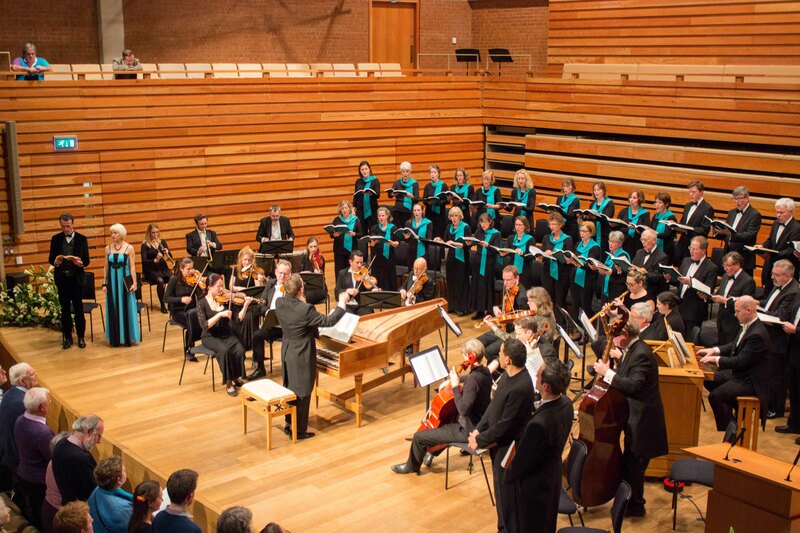 We enjoyed performing Vivaldi’s Gloria in May 2016. Written in around 1715 it is a joyous, sparkling piece for choir and soloists and it is always a great pleasure to perform. But also, every excitingly, and building on our tradition of presenting new music, we also performed a selection of pieces from Firehead Editions. This is a collective of three contemporary composers: Frederick Frahm, Huw Morgan and Nicholas Wibberley. They have written music for a wide variety of different contexts and are all distinguished composers, conductors and performers. 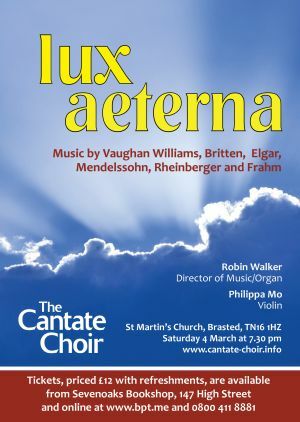 We sang a range of different pieces by them including Frederick Frahm’s Who is Wise Among You and the premiere of a piece especially written for us by Huw Morgan, Ave Regina Caelorum, dedicated to Robin Walker and Cantate Choir. We really enjoyed working on this new material and were delighted to perform our very own piece. All the composers attended the concert as part of a weekend of performances of music from their label. 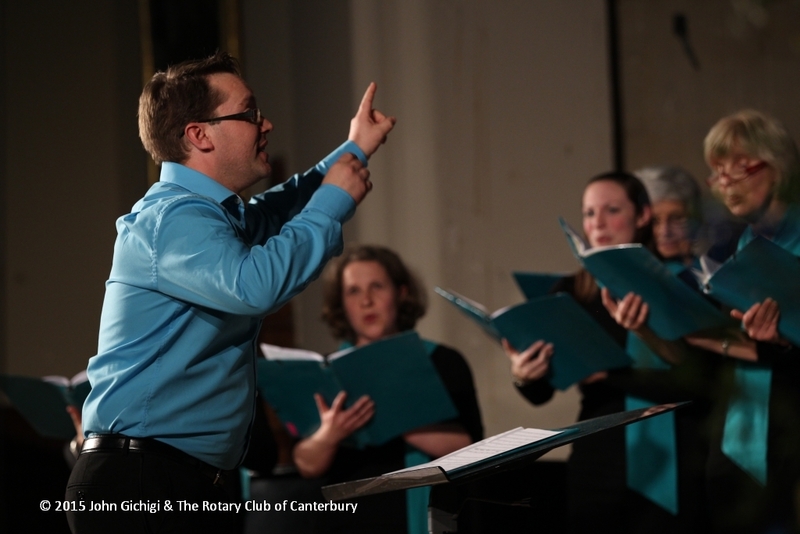 The Cantate Choir’s recent performance of Handel’s Messiah raised a fantastic £10,500, exceeding our original target. 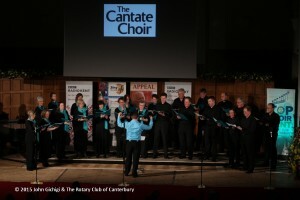 The money raised went to Hospice in the Weald and we were delighted to be able to support them with our first charity concert. We weren’t sure if we would manage to fill the Pamoja Hall in Sevenoaks School but it was a sell out! We would like to thank our sponsors and advertisers who helped us with the fundraising and to everyone who donated prizes for the charity raffle. And of course, thank you to all those who came and were such a great audience for us. It was a thrilling evening – We hope you enjoyed it as much as we did. 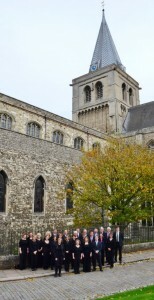 Cantate Choir visit Rochester Cathedral. For the weekend of October 24th-25th we were privileged to be the visiting choir at Rochester Cathedral singing the services on Saturday and Sunday. 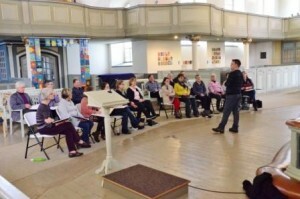 This was a wonderful opportunity for us to sing church music in this beautiful, historical setting, joining a tradition of music for worship that has been continuous since 604AD. We prepared a fantastic series of pieces spanning the centuries of the finest church music from Ramsay, Purcell and Ayleward to Stanford, Howells and Harris and up to the modern day with the Missa Brevis by Dove. 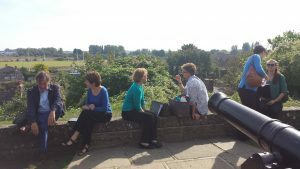 From rehearsing in the music rooms in one of the towers to sharing a lunch together at Pizza Express as well as becoming, for a short while, part of the life of the cathedral, the whole weekend was very enjoyable. We were delighted to receive so many compliments for our singing from the congregation. It was particularly special to hear the music in the beautiful acoustic of the cathedral and we hope to return to perform in this glorious space some time in the future. 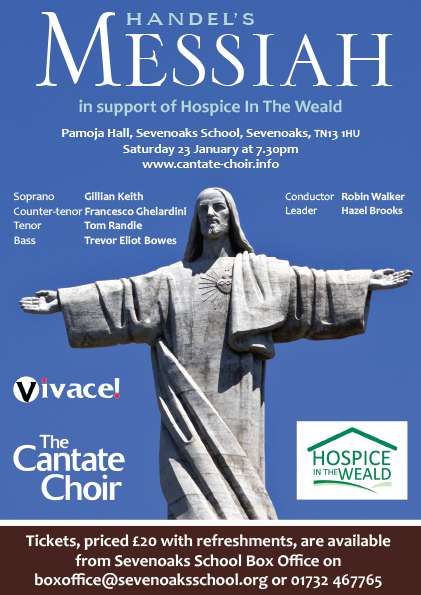 The Cantate Choir with orchestra ‘Vivace!’ and internationally renowned soloists gave a gala charity performance of this most wonderful of Oratorios to raise money for The Hospice in the Weald. The Cantate Choir raised over £10,000 for Hospice in the Weald through it’s Gala Charity Concert on 23rd January 2016. This organisation provides the most outstanding palliative care to the terminally ill, and is heavily reliant on the generosity of the public, local businesses and organisations. Our guest of honour, Lord Sackville, introduced the concert. The choir performed Handel’s masterpiece under the baton of Robin Walker accompanied by orchestra ‘Vivace!’ who played on period instruments. 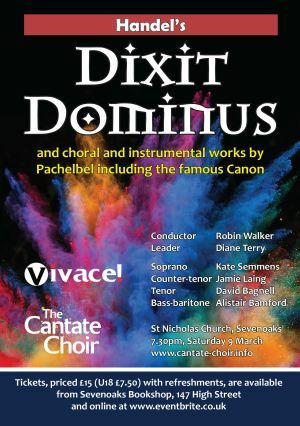 Cantate also welcomed internationally renowned soloists: soprano Gillian Keith, counter tenor Francesco Ghelardini, tenor Tom Randle and bass Trevor Eliot Bowes. Summer 2014: Norway tour and Concert, Pining for the Fjords. In late May, The Cantate Choir went tour again, this time to Norway. See the news pages for pictures of the trip. 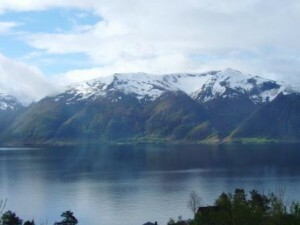 They gave a concert in Bergen cathedral after which they travelled to the heart of Norway to rekindle their friendship with The Førde Kammerkor to perform there. 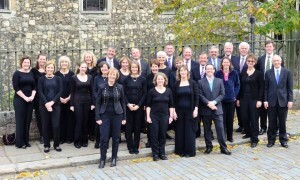 This choir came to sing with Cantate in Sevenoaks in October 2012. 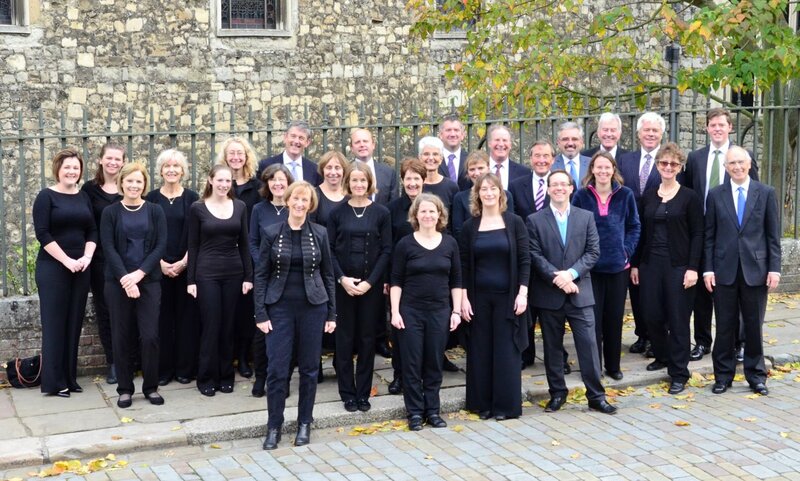 Once returned the choir reprised the repertoire from the tour to present to an Audience at St. Martin’s Brasted. 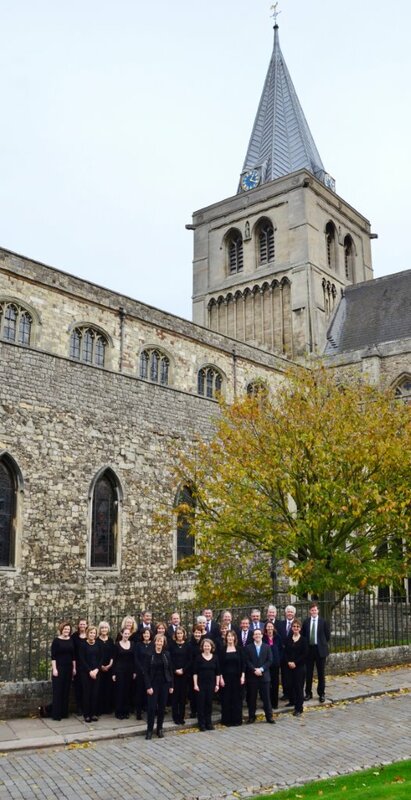 The concert included performances of Grieg, Norwegian folk songs, Monteverdi’s Beatus Vir, Weelkes, Morley, Stanford and Vaughan Williams, performing madrigals outside on a lovely summer’s evening before moving into the church for the rest of the concert. In May Cantate went on a choir tour to Norway to perform at concerts in various locations, renewing friends with Forde Kammerchor who visited the UK a few years ago and performed with Cantate in Otford. The choir first sang in Bergen Cathedral, joined by GNEIS, a young talented local choir. 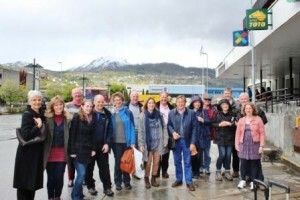 Then taking the trip up the coast the choir visited to Forde. 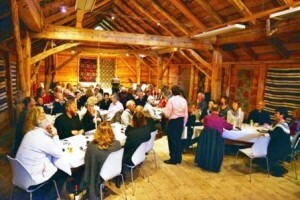 The Forde Kammerchor were wonderful hosts for our visit and everyone enjoyed a convivial evening in a traditional barn where we all rehearsed ready for a concert at Forde Art Gallery. You will see some photos of the choir on the trip, including the one where the two choirs performed the Tapsrondo together! 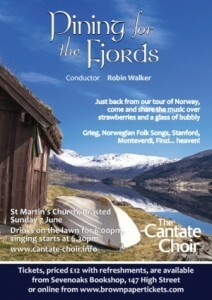 Pining for the Fijords was our June concert. It was a lovely opportunity to sing the music prepared for the Norway tour to our audience at home. It also meant those choir members who were unable to go to Norway were able to perform some of the special Norwegian-flavoured repertoire that the choir had worked on; while for those who did go it was a chance to remember the unique atmosphere of light and water of Norway in summer, and think of the friends they made there. So on a lovely, sunny summer’s evening we returned to Brasted to sing music from across the ages. We sang madrigals in the open while the audience enjoyed strawberries and a glass of sparkling wine, then moved inside to perform Monteverdi Beatus Vir along with English music from composers such as Stanford and Vaughan Williams, Norwegian songs by Grieg as well as traditional and modern settings of Scandinavian folksongs. 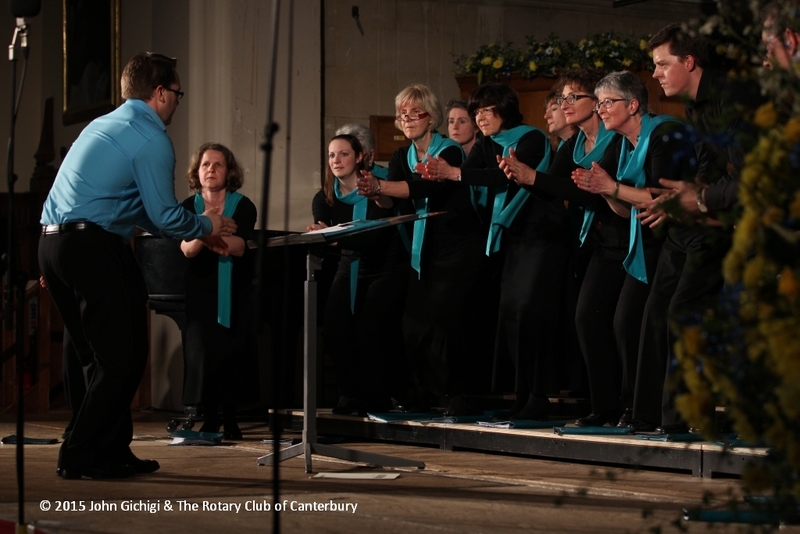 As winners of Top Kent Choir, 2014, we performed at a special celebration in March to mark five years of this competition which does so much to raise money for charity. 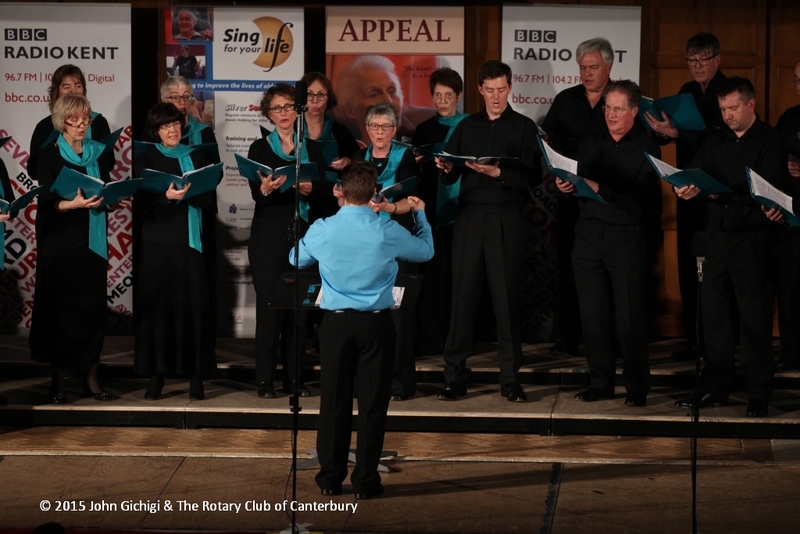 We joined six other choirs, all past finalists or runners up, each performing a 15 minute repertoire in the Shirley Hall in Canterbury. 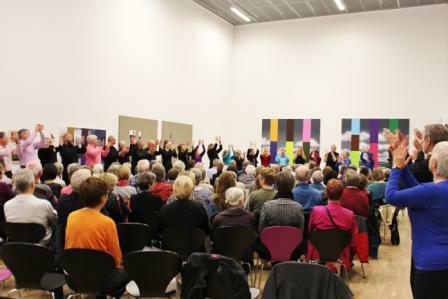 We included a clapping song too – which you can see us performing below. 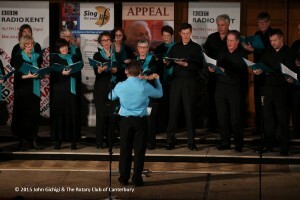 The evening culminated in a special performance by all the choirs and audience together of a special arrangement of ‘Help’ – the song by the Beatles – to mark its fiftieth anniversary. The whole event celebrated live music and singing, and we were delighted to be able to take part. (photos copyright John Gichigi and The Rotary Club of Canterbury). 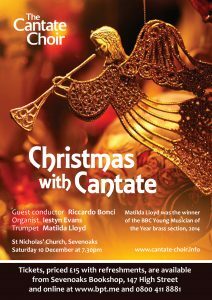 We were delighted to welcome so many people to our Christmas concert last Saturday at St. Nicholas Sevenoaks. We had a uplifting evening singing carols from across the ages, from There is No Rose to a beautiful arrangement of My Heart Will Always Wander by the modern Norwegian composer Magnussen in its first UK performance. There were readings inspired by the Christmas story and some fantastic original accompaniments from the brass quintet Mardi Brass. They also played a lovely, measured arrangement of the Symphony from the Messiah and a spirited and witty medley of more modern Christmas songs. With audience carols and the rousing backdrop of the organ played by Riccardo Bonci we hope our audience had as enjoyable evening as we did. On Tuesday before our concert we sang carols at Sevenoaks Station for the Red Cross Ebola appeal. 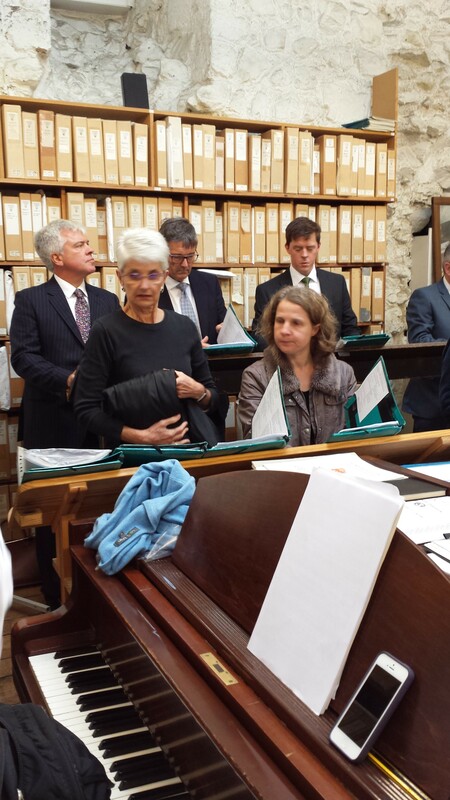 We thank our friends and family who helped us with the collection as we sang. We raised over £350. We continued our collection after the concert itself and were able to contribute in total to the fund just over £1000 which was a fantastic achievement. Thank you to everyone for your support.